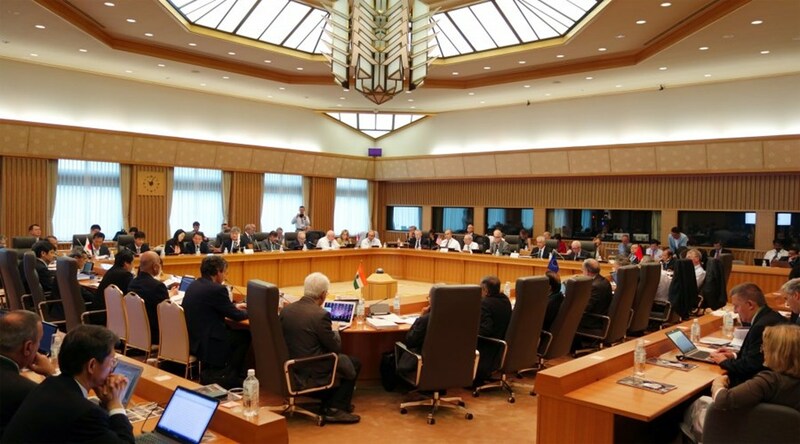 Participants to the 12th ITER Council in Tokyo on 19-20 June reaffirmed the importance of sustained efforts regarding schedule implementation, while recognizing the challenges due to the first-of-a-kind nature of ITER. The ITER Council met for the twelfth time in its history on June 19-20 in Tokyo, Japan. The meeting brought together senior representatives from the seven ITER Members—China, the European Union, India, Japan, Korea, Russia and the United States—under the chairmanship of Hideyuki Takatsu (Japan). The Council took note of the increasing pace of construction activities on the ITER site and progress in the manufacturing of components and supporting systems, highlighting the fact that major contracts have been placed recently and many leading industries are now involved in ITER construction. During the 12th ITER Council, significant progress was reported in the manufacturing of ITER magnets: over 420 tonnes of niobium-tin strand (Nb3Sn) for the toroidal field conductors (90 percent of project needs) and 133 tonnes of niobium-titanium (NbTi) strand for the poloidal field conductors (51 percent of project needs) have been produced to date. The governing board of the ITER Project reunites delegates from the seven ITER Members—China, the European Union, India, Japan, Korea, Russia and the United States. The Council reaffirmed the importance of sustained efforts regarding schedule implementation, while recognizing the challenges due to the first-of-a-kind nature of ITER. In this context, the governing body of ITER welcomed improved collaboration between the ITER Organization and the Domestic Agencies as part of the Unique ITER team. In the wings of the Council meeting, a Procurement Arrangement was signed for the Neutral Beam Remote Handling System with the European Domestic Agency. The Neutral Beam Remote Handling System, comprising several sub-systems, will allow the remote maintenance of components inside the neutral beam cell, such as the vacuum tank, netural beam line components, and vacuum and diagnostic systems. In addition to floor- and wall-mounted manipulator systems, the system features a remotely controlled, ceiling mounted monorail/crane that will serve both as the first assembly tool for the neutral beam system, and the remote maintenance tool for neutral beam components. The Neutral Beam Remote Handling System is one of the most diversified of the ITER remote handling systems and its design, procurement and operation will rely on a wide range of engineering skills. Click here to view the photo gallery of the Twelfth ITER Council. Read the Press Releases in English and in French.